THE FBI called it Operation Varsity Blues. It was an investigation centred on William Singer, an enterprising college counsellor, who earned $25m from all manner of powerful people by fraudulently securing spots for their children at highly selective universities like Stanford and Yale. Among his clients charged with crimes were Felicity Huffman and Lori Loughlin, two well-known actresses; Gordon Caplan, the co-chairman of an international law firm; and William McGlashan, a Silicon Valley private-equity executive who champions ethical investing. To grease the lucrative scheme, Mr Singer bribed proctors of admissions exams to fake scores and bribed athletics officials to accept wealthy children with concocted sports r¨¦sum¨¦s, according to court documents unveiled by federal prosecutors on March 12th. The lurid details have provoked embarrassment for universities and Schadenfreude for the public. There is also an entirely legal way to corrupt the elite admissions system, which for some reason generates less outrage. Mr Singer grasped this dynamic: There is a front door ¡°which means you get in on your own¡± and a ¡°back door¡± secured by multimillion-dollar donations to universities, he explained in a recorded call to a client. What Mr Singer did¡ªfor 761 buyers, he claimed¡ªis create a ¡°side door¡± by bribing university officials and faking test scores that would achieve the same result at one-tenth of the cost. In effect, his scheme granted mere multimillionaires access to the billionaires¡¯ entrance. Getting in through the side door was a sordid undertaking. According to prosecutors, Mr Singer bribed Rudy Meredith, then a women¡¯s soccer coach at Yale, to accept a student who did not play competitive soccer. The relatives paid $1.2m for the slot. Ms Laughlin, one of the actresses, and her husband paid $500,000 to get their daughters, both Instagram influencers and minor celebrities in their own right, designated as crew-team recruits for the University of Southern California¡ªdespite the fact that neither one rowed. Mr Caplan, the international lawyer, allegedly faked a learning-disability diagnosis for his daughter and paid $75,000 for a boosted admissions score. The prosecutors, who flipped Mr Singer, enumerate several other jaw-dropping tales, backed up with wiretaps of the various notables admitting the finer details of the schemes. Rich children are already unfairly advantaged in the game of elite university admissions. They start out with stabler families, better schools and helpful networks. Elite American colleges then operate a large, entirely legal affirmative-action programme for the rich. Most highly selective American universities indulge in ¡°legacy preferences¡±¡ªpositive discrimination for relatives of alumni¡ªthat disproportionately benefit the already rich. Such universities also have lax standards for recruited athletes, which helps rich children. Opportunities to row, fence or play golf do not abound in the ghetto. The result is that, for all the paeans sung to racial diversity, socioeconomic diversity in the hallowed ivy quadrangles remains woeful. 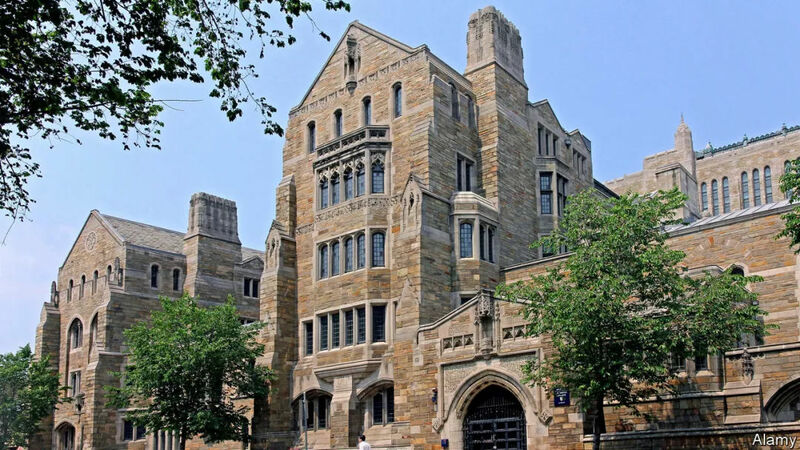 A survey conducted by Yale¡¯s student newspaper found that twice as many students come from families in the top 5% of the income distribution as from the entire bottom half.